The T12 is an industrial grade, self-propelled, compact high performance ride on scrubber, manufactured in the U.S. 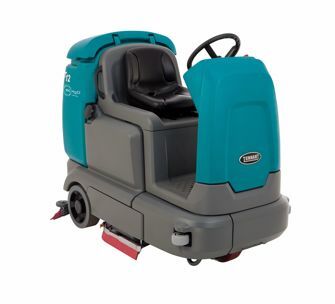 The T12 has the ability to clean virtually any hard floor surface. The combination of this machines high performance scrubber size and front drive/steer system means you can clean floors anywhere a full size walk-behind scrubber can go. T12 is available with a disk scrub deck or cylindrical scrub/sweep deck. With the cylindrical scrub deck; manual sweeping is virtually eliminated. You can increase the cleaning path from 32 inches to a whopping 41 inches (28% wider!) with the optional scrubbing side brush. With fully charged batteries, the T12 will clean for up to two and a half hours. Run time can be increased up to four and a half hours with the optional battery pack upgrade. Power key ignition switch, and emergency power kill switch are both standard features on the this machines dashboard. An integrated operator safety switch stops the machine unless the operator is seated. The XP version of the T12 moves most of the dashboard controls to a simple touch pad mounted in the steering wheel center. Powerful AC drive propel motor allows for excellent ramp climbing capabilities. Because the AC drive propel motor is sealed and brushless, it offers extended component life, and less maintenance. Improved cab forward design means easy operator ingress and egress from either side of the machine. Large operator legroom means that the T12 is comfortable and reduces fatigue. The T12 also has excellent operator visibility for confident maneuvering in tight or congested areas. Unlike other scrubbers which require both feet to operate, this particular model has car like pedals for easy single foot operation. With cast aluminum drive system, cast aluminum cylindrical brush deck, and cast aluminum squeegee assembly the T12 is corrosion resistant. Further corrosion resistance is enhanced by the rotationally molded polyethylene body panels, and solution/recovery tanks. Steel components on the T12 are coated with industrial grade enamel paint. Large Green 1-step start button on the dashboard turns the preset scrub functions on and off. Once you have set the desired scrub functions, this is the only button you need to press. All of the functions on the T12 can be controlled independently as needed. A standard feature is the “economy” setting for brush pressure and solution flow. When in the “economy” mode the T12 run time is increased, brush wear is decreased, and water/detergent consumption are decreased. With Tennant’s on-board ec-H2O technology system, water is electrically converted into an innovative cleaning solution. Since ec-H2O reduces water consumption dramatically, floors are drier and ready for traffic immediately. The ec-H2O technology system is certified by National Floor Safety Institute (NFSI) to help reduce potential for slip-and-fall accidents. NSF International has further certified that the ec-H2O technology system meets appropriate food safety regulations. You should consider the ec-H2O technology system to help contribute to LEED points in your facility. Another popular and useful option for the T12 is the Hydrolink battery watering system. Hydrolink battery watering system will ensure that your batteries are filled to the correct level and help lengthen battery life. The battery watering system requires no special training (simple to use) and requires no tools.